The Tyrone Bobcats are in some tall cotton now day. The Bobcats are rubbing elbows with the likes of Tipton, Shattuck, and Pond Creek as one of the top programs in class C the past two seasons. Tyrone has gone 11-1 and made it to the semifinals in back to back seasons. 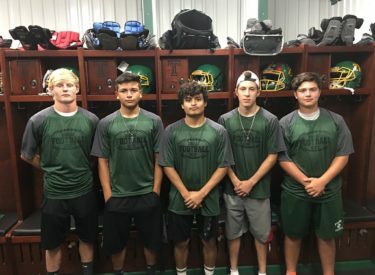 And with five of eight starters back on offense and six of eight back on defense, the Bobcats have reason to believe they can be a force in 2018 under 15th year head coach Josh Bell. Interest is soaring in T-town with 28 out for football. Tyrone has strong bookend classes with 10 seniors and eight freshmen. Some of the key Tyrone players include Sr. QB/CB Chance Duty, Sr. TE/LB Alex Landaverde, Sr. RB/S Antonio Pacheco, Sr. WR/CB Alex Torres, Sr. LB/FB Noah Rodriguez, Sr. G/DE Addison Heitschmidt, Sr. C/DE Abraham Valdez, and Jr. WR/DE Mathew Clancy. Tyrone loses three key seniors from last year’s team. Tyrone was featured during the Sportsguys Wednesday morning. The Bobcats have another interesting slate of games at Pond Creek joins the district. Tyrone has a home test with Turpin to begin the season on 102.7 and kscbnews.net. The Cats play Chetopa most likely in Enid and travel to Salina to play St. John’s.